Last week, on a hot summer afternoon, Xandi, and I went out on a date. He wanted to spend some bonding time with me at the nearby mall. 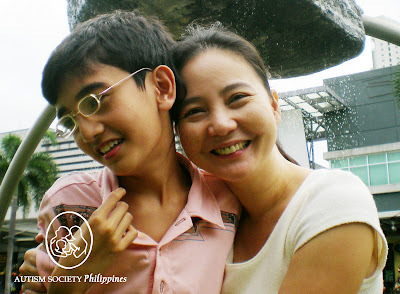 As his older brother, who also has autism, is busy with other activities; this is his chance to “act” as an only child, even just for the afternoon. My two pre teen boys don’t fight physically or verbally. But their sibling rivalry is very evident in their competing for our attention. Xandi, being the younger, is the “drama prince” of the family. He has his own way of getting what he wants. Xandi learned that throwing a tantrum is not the best way to get an attention, whether positive or negative. And he knows that constant whining will be totally ignored. (This behavior we have together with his therapist, worked so hard to fade.) So he switched to a new strategy. Using his innate charm, we are manipulated into agreeing to his desires, and he tries to convince us that his requests are legitimate. As an example, if he wants something from me, he doesn’t ask for it right away. He approaches me with his sweetest smile and says, “Kiss mommy, kiss mommy,” and showers me with kisses and hugs. When I am so engrossed and emotionally high, that’s the time he asks for what he wants. What an impeccable timing! How can I say no to that? On our date, we did not have any plan. We just wanted to have a lazy, stress free and spontaneous afternoon. I asked him to lead the way. We stayed at Time Zone until he got hungry and requested to eat at a pizza parlor. I don’t normally eat pizza, but when Xandi flashed his angelic smile, I was instantly mesmerized and said yes. It takes al least 20 minutes to prepare a pizza. Waiting is a skill that Xandi has not perfected to date. Five minutes after we placed our orders, “Mommy, where is my pizza?” Xandi murmured the same phrase repeatedly. Patiently, I explained to him that the pizza will be ready in a few minutes. Every time a waiter passed by our table, he held my hand and projected “a week-long-unfed-hungry child look”, ready to feast on his first meal. The head waiter overheard him and brought mojos (fried potato wedges) to appease him. With gusto, he feasted on the mojos, but this did not make him forget his pizza. So, he devised another strategy. To my surprise, he got up from his chair, went to the head waiter, flashed a very sweet smile with matching “beautiful eyes” and said, in a very loud voice (probably to elicit sympathy from other people) “I am a special child and I want my pizza, please!” Instantly, he got his pizza. Now, that’s acting, worthy of an academy award! By the way, we don’t teach that in therapy. Gina Bermudo, ASP trustee will be facilitating May 22 Family Support Group.Call 9266941/9298447 to reserve a seat. Only 15 slots available. Buy your copy of “Mga Awiting Alay sa Autismo” by calling 926-6941 or 9298447. Part of the proceeds of the CD will help ASP programs and services. For more information email us at autismphil@pldtdsl.net or visit our community website. By the way, have you ever heard about yummy-cebu.com? I hear they just finished a new contest called Mama's day out!